My Christmas music is getting a number of performances around the world this Christmas, including locally here in New Zealand and in Dunedin. I was contacted by Professor Caldwell of Susquehanna University in Pennsylvania earlier in the month, letting me know that my short work, Love Will Make The Roses Grow was to be performed by the Susquehanna University Women’s Choir on the 18th of November. Auckland’s “The Three Mezzos Vocal Trio”, comprising accomplished singers Lynne Anderson, Margo Knightbridge and Barbara Lynch, performed the three voice version of my recent composition Mary Sings A Lullaby on November 20th in the Ballroom at Highwic in Epsom. Also on the North Island, the Renaissance Singers in Hamilton performed Mary Sings a Lullaby, in four parts, on the 20th of November, together with Samhain, Beltane, Yule and Lammas from my Wheel of the Year song cycle. “Mary” is getting a number of performances around the world – it has other scheduled performances for 2011 by choirs in England (London) and Canada, and possibly Hong Kong (China). Probably the most exciting performance for me, though, is one by a local choir, Southern Consort of Voices. 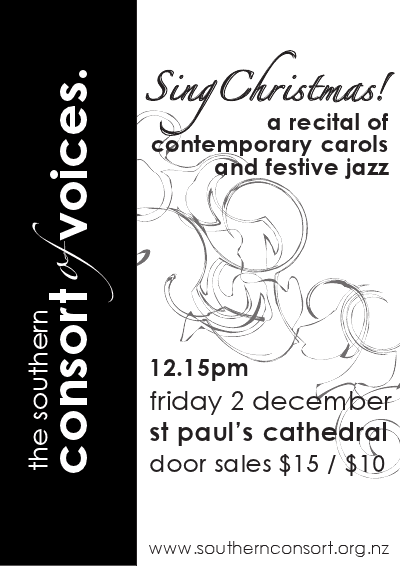 They’re a Dunedin-based chamber choir, and will be performing my 2010 piece Sing Christmas! in St. Paul’s Cathedral in the Octagon at their traditional lunchtime Christmas concert. The concert is at 12:15 pm, tickets are $15 and $10. This concert is particularly exciting for me, because I get to hear my work performed live – usually I only get recordings, or word of mouth that the performance occurred! The concert is also exciting because I used to sing in St. Paul’s Cathedral. Hearing my own music performed there by a local choir will be a real honour. This year’s Christmas concert on Friday, December 2nd, is to be held in the traditional venue, St Paul’s Cathedral at 12.15pm. But the programme is far from traditional, with a variety of works from the 20th century, including several New Zealand pieces. The concert will begin with the energetic Noel by Roxburgh and the lilting Shepherd’s Carol by Bob Chilcott. These are followed by a couple of charming vignettes from John Ritchie and the warm and colourful Bless this Child from Christopher Marshall’s Triptych (No. 1). The title song, Sing Christmas, is by local composer, Leanne Veitch, and features playful rhythms and even a little percussion. We allow ourselves a step back in time to sing three Marion pieces, notably Phillip’s beautifully-constructed renaissance motet, Hodie Beata Virgo, and two gorgeous Russian pieces, Dostoino Yest by Tchaikovsky and Bogoroditse Djevo by Rachmaninoff, from his Vespers. We then finish with a flourish, tackling a couple of snappy Jazz numbers. If you’re a Dunedinite, come along, and support a great choir, and get a chance to listen to some terrific music in a beautiful accoustic.